Who is it for? 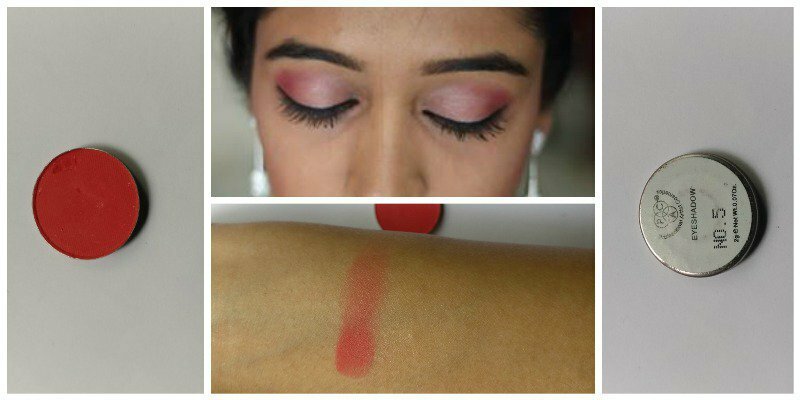 PAC Eyeshadow No 5 Is For those looking for a reasonable eyeshadow, in a matte pink shade. Like most refill eyeshadows, the PAC ones too come in a magnetic pan that is placed in a plastic casing. The base of the pan has the shade number and quantity. Decent packaging, I’d say! The PAC eyeshadow no 5 is a matte pink shade. It works really well to add a pop of color onto the eyelids. The pigmentation of this matte shade is very strong. Just a dab of the shade is enough. And it’s super buildable. In terms of texture, I’d say quite good. It’s smooth, but not butter like. When the texture of a product is smooth, the application is easy. The eyeshadow glides onto the lids easily and blends in well. PAC, as a brand, is of great quality and very reasonable. INR 300 for an eyeshadow is very reasonable. I’ve used this on a bride and a whole lot of clients and there have been no complaints. It stays in place for hours without any fade-age or creasing. I know there’s not much that can be done. But I wish the packaging of refill pans could change a little. Of course!! It’s reasonable, long lasting and a beautiful shade. So go ahead!! PAC Longlasting Kohl Pencil Black – Best Kajal ? Loved the shade 🤩🤩🤩 where to get this from ?? ?